I'm not having much luck finding examples of original or reproduction Visigoth swords and spears ca. 410 CE. I've found some modern book illustrations, but although those are helpful for a general impression the details of the sword hilt are not clear. I have good images of Visigoth helmets. But the sword evades me. Any suggestions? Well, there is the sword found at Pouan, which is thought by some to be related to the battle of the Catalaunian Plains (451). Some even suggested that it was the grave of Theodoric himself, although others doubt that. Regardless, there is a good chance that is a Gothic grave, from around 450. This also represents the beginning of the characteristic Germanic gold-hilted spatha. If one supposes that it was in fact deposited there in 451, it may have been made in the 430's or so, but that's conjecture on my part. Prior to swords of this type, I guess the Goths most likely used Roman spathae, or perhaps even occasionally Hunnish swords. Unfortunately, the early Germanic swords seem to be a bit of a forgotten subject in archeology, with the exception of the swords from Illerup-Adal. Why this year? The sack of Rome? I have this image in a book here, and actually if you have it bigger before you, you can see that pommel and crossguard are recreated out of plexiglass. Like most of the gold hilted spathae, these parts did not survive and must have been made out of organic material. Ivory, wood, bone antler and horn are the most likely materials. Thanks for that detail! I couldn't tell if it was metal or plexi. Alaric was a Roman administrator (of Illyricum) and the Visigoths were a Roman foederatus, so I would look at standard military issue Roman spathae. I agree. Stilicho and Emperor Honorius can be seen carrying spathae with sphere pommels in these diptychs, made c. 400 AD. I think the one of Stilicho is clearly iranian. I got some pics of gepide swords, but I'll see what I can found. And the one Honorius is wearing also doesn't seem like the "typical" spatha. I don't know what it is actually. A good example of the basic hilt construction are the hornhilts from the nydam bog find. The second from below of the horizontal swords f.e. 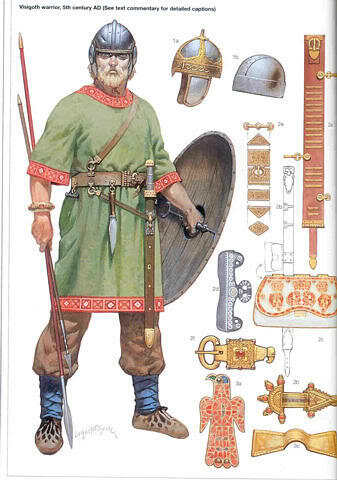 Although, given the increasing impact of the huns at the beginning of the 5th century, hunnic swords could have been in use in the visigoth army as well. While I'd really like to think that the horn hilted sword you posted is the prototypical Germanic sword, I do have trouble believing that it was so widespread over the entire Limes. One from Nydam, Denmark, one from Evebø, Norway and one from Cumberland, England. More fragmented finds are from Sweden and Denmark. Behmer thinks it's an indigenous Germanic sword, perhaps inspired by Roman examples. http://www.myArmoury.com/talk/viewtopic.php?p=204398#204398 and the attachment for an overview of the Behmer types, thanks to Kirk Spencer. I'm not sure what the new publication on the swords from Illerup Adal says about it, as I have not read those books yet, unfortunately. Most of the swords I've seen so far from Illerup Adal have the perhaps more "typical" Roman spherical pommel, but perhaps decorated in a "Germanic" fashion. A few of the blades are definitely Roman. I spoke mainly about the blade type when I stated the ubiquity of the design. My source, the RGA is the german standard lexicon on migration period european archeology, Marcin Biborski is an expert on his matter and I dare to trust him on this. This is also consistent with actual archeologic evidence. .
Behmer wrote his book "Das zweischneidige Schwert der germanischen Völkerwanderungszeit" in 1939. This makes it difficult as a standalone source twice, as on the one hand, it does not incorporate any find or analysis made in the last 7o years and on the other hand was written during a period which is quite problematic for "germanic" archeology when people like Kossina gave a direction to the matter which tended to mingle with the nationalistic ideas of the Nazis. The regionalistation of types based on the location they were found is also problematic. In the context of the bog depositions a carriers of these items travelled a long way to meet their fate, also, weapons were trade goods and prestigious objects and so highly mobile. A better and more recent source is the Dissertation of Christian Miks "Studien zur römischen Schwertbewaffnung" (Rahden 2007). The Hilt design which you identify with the Behmer Type 1, true enough was only found in the north. On the other hand, how many complete 4th century organic hilts do you know of beside these? They do survive only rarely. They are organic, which means that they tend to decay fast in most kinds of soil. So, when we look at the sword tangs, which are quite short on late 4th and early 5th century spathae, we can deduce a short hilt and slim guard and pommelpiece. Fifty years later, we find the first gold hilt spathae, like at Pouan above or Tournai, which also have the same kind of guards. When we look at the middlepiece of the hilt, we can see a clear connection to the classical roman hiltstyle, as both share fingerlobes to give a better grip. So we can set this design in between the classical roman hilts and the early migration period "germanic" hilts. The difference are, on first glance, the rounded guards of the roman sword hilts and the straight flat guards of the "germanic" spathae. But what's "germanic", anyway? The bulk of the bog swords can be classified as roman and the rest are roman blades with homemade hilts. As you mention Illerup Ådal, which is of course a bit older then the Nydam horizon where the sword we talk about was found, even the bulk of the swordbelts and baldric were of roman manufacture. I don*t think that the differences between swords in Germania Libera and the provinces are so big. The people which used them in this timeframe were the same on eac side of the limes, anyway. The roman guards tend to flatten out in the 3rd century anyway. So by a stylistic analysis we can state that the hilt desgin we are talking about doesn't have any significant features which determine a babaric-germanic origin. Another point is the fact that on the other Nydam hilt of the same style (yes, actually there are two hilts of this type in Nydam, one of which was lost in the last century, and many loose guards of exactly the same design) you can see an imprint of pommelcap of the Vieuxville type. This type, was found in the whole limes region from the Netherlands to the Danube delta. Mainly in burgi and castles. So we have a roman pommelcap on a roman blade, and the piece in between has no features that mark it as germanic. I find it reasonable to believe it is also most certainly roman. To echo what Paul said I'd think the elite would be armed with germanic volkerwanderungziet sword inluding ring-hilts. whilst the rank and file would include Hunnish and sub-Roman weapons. The earliest ring-hilt sword I have heard about is the Snartemo V, made c. 500 AD. It had the ring in the lower guard, who knows why. 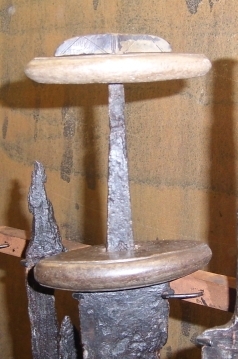 The more typical ones with the ring attached to the pommel show up by the late 6th century. I really doubt there were ring-hilt swords around by the time of the Sack of Rome in 410 AD. Hunnish swords had garnets and other jewellery. Not exactly rank and file materiel. Armart dates this one to late Roman/early migration era. These kind of ring pommel swords date to the time of the Marcomannic War, they were popular in the beginning of the 3rd century and are so 200 years younger than the period we are talking about. The interesting point of Stephen is his assumption that higher ranking persons would have different weapons than lower ranking persons. There is a grain of truth in this. In Illerup (again 150 years earlier) for example, the main part of the swords were associated with roman baldrics, while the more richly furnished ones also had more richly furnished baldrics. But these were not made in the roman style, but in an indigenous one. On the other hand, the blades of this richer swords were distinctly roman. This however can not be determined with such certainty in the case of the later Nydam bog sacrifice which falls in the timeframe we are currently discussing. 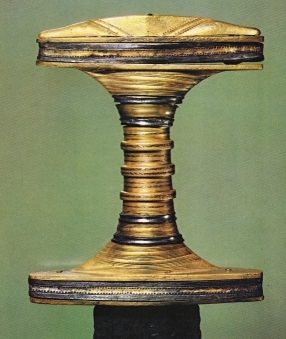 The cast bronze hourglass shaped swordhilts which form the upper class hilt design from this period (roughly the Behmer Type 5) have flat, boat shaped pommelcaps which are associated with the Vieuxville Type. These, as I stated earlier, are a roman form of pommelcap. But at least to my eye, the pommelcaps on the hourglass hilts do form a subtype, they are mostly broader and do generally tend to have animal heads depicted on them. Something not so common on the normal Vieuxville Type. And the style of hilt design is not found south of Scandinavia. These hints may indicate that, at least in southern scandinavia, the rich and mighty tended to carry swords with indigenous hilt designs even in this later period of time. But I wouldn't easily apply this custom to another tribal formation in the far south living literally next door with the romans for centuries and experiencing cultural influx from iranian and turcish steppe nomadic peoples like the Visigoths. And a very important point about this distinct timeframe is that by 410 AD the "visigothic people" who took Roma were actually a revolting foederati army which acted as an important fieldarmy for the Empire over a considerable period of time. Would they still furnish the swords with their own design? Or would they carry weapons produced in the central army fabricae which also equipped the other parts of the roman military? Sadly I have not found any goth or even gepid swords with armguards... In our museums are just naked blades. That's great news! I was not aware of this title. Unfortunately, neither are the Dutch university libraries, yet... So I guess I have to save some money. Hey Henrik, I'm just curious what makes you say that Stilicho's sword is Iranian. Do you have any pictures of such swords? I'd also love to see some pictures of gepid swords if you have any.